Corticotropin-releasing factor (CRF) is a neurohormone that plays a crucial role in integrating the body’s overall response to stress. It appears necessary and sufficient for the organism to mount functional, physiological and endocrine responses to stressors. CRF is released in response to various triggers such as chronic stress. The role of CRF and its involvement in these neurological disorders suggest that new drugs that can target the CRF function or bind to its receptors may represent a new development of neuropsychiatric medicines to treat various stress-related disorders including depression, anxiety and addictive disorders. 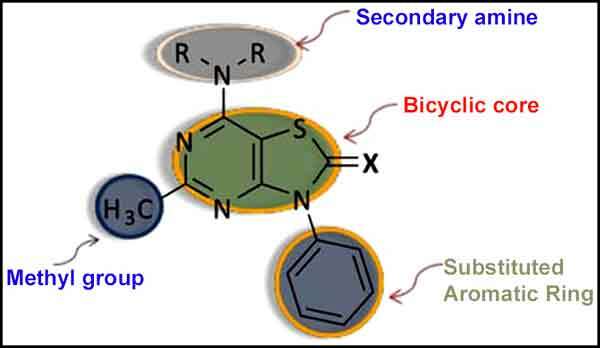 Based on pharmacophore of the CRF1 receptor antagonists, a new series of thiazolo[4,5-d] pyrimidines were synthesized as Corticotropin-releasing factor (CRF) receptor modulators and the prepared compounds carry groups shown to produce optimum binding affinity to CRF receptors. Twenty two compounds were evaluated for their CRF1 receptor binding affinity in HEK 293 cell lines and two compounds 5o and 5s showed approximately 25% binding affinity to CRF1 receptors. Selected compounds (5c and 5f) were also evaluated for their effect on expression of genes associated with depression and anxiety disorders such as CRF1, CREB1, MAO-A, SERT, NPY, DatSLC6a3, and DBH and significant upregulation of CRF1 mRNA has been observed with compound 5c. Thiazolo[4, 5-d]pyrimidines, corticotropin releasing factor, antalarmin, anxiety, depression. Department of Pharmaceutical Sciences, College of Pharmacy, South Dakota State University, Brookings, SD 57007, USA.